The three most common aggressive non-Hodgkin lymphomas (NHLs) are diffuse large B-cell lymphoma (DLBCL), Burkitt lymphoma (BL), and peripheral T-cell lymphoma (PTCL) and as a group accounted for an estimated 24% of all lymphoid malignancies in the USA in 2016. DLBCL is the most common subtype, with an age-adjusted incidence of 6.95 cases per 100,000; is more common in whites; and has a 5-year relative survival of 59.6%. Key DLBCL risk factors include a family history of NHL, genetic loci, infections (HIV/AIDS, HCV, HBV), organ transplantation, certain autoimmune diseases (systemic lupus, Sjogren syndrome, celiac), and several suggestive behavioral factors (body mass, alcohol use, vegetable intake, and recreational sun exposure). BL is much rarer, with an age-adjusted incidence of 0.40 per 100,000 and a 5-year relative survival of 56.4%. BL is often classified as endemic (with a strong association with EBV and malaria), immunodeficiency-associated (with strong associations with HIV/AIDS and solid organ transplantation), and sporadic (with suggested associations with several lifestyle factors). PTCL has an age-adjusted incidence of 1.15 per 100,000; is more common in blacks than whites or Asian/Pacific Islanders; and has a 5-year relative survival of 56.0%. Risk factors are least well defined for this heterogeneous and less studied subtype but include a family history of NHL, HIV/AIDS, organ transplantation, celiac disease, and some recently suggestive lifestyle factors. 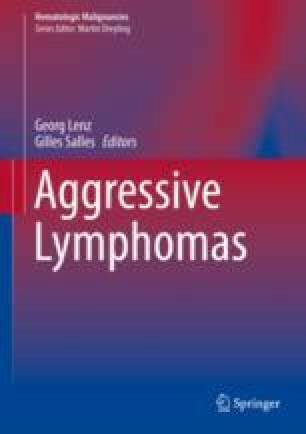 Established and suggested risk factors are both observed across many subtypes (including indolent subtypes) as well as being unique to a single or small group of subtypes, but there does not appear to be a unique risk factor profile for aggressive lymphomas as a group. In summary, the aggressive subtypes of DLBCL, BL, and PTCL have largely unique descriptive epidemiologies and risk factor profiles and thus likely distinct etiologies, with clear implications for understanding pathogenesis and primary prevention. Future research is needed to better characterize heterogeneity for existing and recently defined aggressive subtypes, identify additional risk factors, and link these factors to the molecular underpinnings of these diverse and important lymphoid malignancies. National Cancer Institute. Surveillance, epidemiology, and end results (SEER) program. www.seer.cancer.gov. SEER*stat database: incidence—SEER 18 regs research data + hurricane katrina impacted. Accessed 29 April 2017. National Cancer Institute. Surveillance research program, National Cancer Institute SEER*stat software version 8.3.4. www.seer.cancer.gov/seerstat.